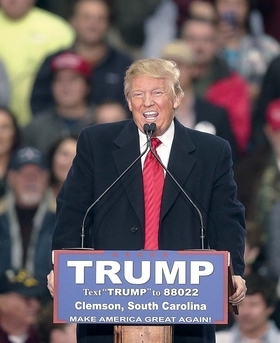 After Saturday's South Carolina primary, the Republican presidential race has realistically narrowed to one candidate, Donald Trump, who has expressed ambivalent feelings about the Affordable Care Act and two, Sens. Marco Rubio and Ted Cruz, who want to erase it. Trump scored a strong victory this weekend over Rubio and Cruz, who essentially tied for second. On the Democratic side, Hillary Clinton, who wants to improve and expand Obamacare, won a significant victory Saturday over Vermont Sen. Bernie Sanders, a champion of single-payer government health insurance, in the Nevada caucuses. The fate of the ACA and the shape of the future U.S. healthcare system is likely to be a major issue in the general election. There also could be a war of words and advertising over the future of Medicare and Medicaid. There's one other long-shot GOP contender, Ohio Gov. John Kasich, who supports the Medicaid expansion part of the healthcare reform law. He plans to slog on through the Super Tuesday primaries across the country March 1. Dr. Ben Carson, who also finished far back in the GOP field in South Carolina, also plans to continue running, though his campaign has fallen apart. Jeb Bush, who came out in favor of replacing the ACA with some kind of system of catastrophic health insurance system, dropped out of the Republican race after doing poorly in South Carolina. Clinton and Sanders next will battle it out next Saturday in South Carolina's Democratic primary, where Clinton has led by large margins in the polls given her support in the state's large African-American population. If she performs as well as expected there, many experts predict she will cruise to the nomination after having survived Nevada with a five percentage point victory. The Republicans will vie Tuesday in Nevada's GOP caucuses. Some experts say Trump will be hard to stop following his strong showing in South Carolina, with a 10 percentage point victory margin. Other pundits, however, say mainstream Republican support may begin to coalesce around Rubio or, less likely, Kasich. Cruz has to do very well among hard-core conservatives and evangelical Christian voters in the March 1 primaries in the southern states to keep his hopes alive. But the next day, the billionaire real estate developer backpedaled, insisting he vigorously opposes the entire ACA. Still, Trump earlier last week said that while he would push standard Republican healthcare solutions such as health savings accounts and sales of insurance plans across state lines, he saw a role for government health programs. For patients who could not afford insurance, he said, “We're going to take care of them through maybe concepts of Medicare.” Like his subsequent comments about the individual mandate, that drew fierce rebukes from other Republicans. On Sunday, Trump continued to break with GOP healthcare orthodoxy. He said Republicans should stop attacking policies to expand coverage. “That's part of the problem with the Republicans,” he said on NBC's Meet the Press. “Somehow they got fed into this horrible position” of opposing expansion. The GOP candidates generally have spoken little about healthcare issues other than to blast the ACA. When the issue comes up, it tends to be awkward for them given that millions of Americans are benefiting from the law. Cruz had a tough encounter late last month with an Iowa voter who told a story about how his brother-in-law was only able to afford health insurance after the Affordable Care Act took effect, but by then his cancer had advanced too far and he died last year. “Mark never had healthcare until Obamacare,” the man said. “What are you going to replace it with?” The man repeated the question after Cruz launched into his standard critique of the ACA. The senator was widely panned for his failure to offer a convincing solution. Whatever the GOP candidates say now, any Republican who wins the presidential election in November will face heavy pressure to roll back the ACA given the Republican base's strong opposition to the law and the candidates' repeated vows to repeal it. In an interview, Chris Jennings, a Democratic healthcare strategist and former senior adviser to the Obama White House, said a Republican president and Congress would at least substantially reduce the ACA's premium tax credits and cut and restructure Medicaid in a major way. Where a Republican-led government would run into big problems would be in reducing or eliminating the subsidies and repealing the individual mandate while trying to keep the requirement that insurers accept customers regardless of preexisting conditions. Insurers would intensely oppose that because it would create huge risk selection problems and lead to a so-called death spiral in the insurance market. They would threaten to pull out of the individual market, potentially driving up the number of uninsured Americans, he warned.